The Nomonhan incident in 1939 showed that the japanese tanks were unable to cope with its tasks due to the superiority of the soviet tank models but also due to the use of massive artillery barrages used by the Red Army to stop enemy tank advances. 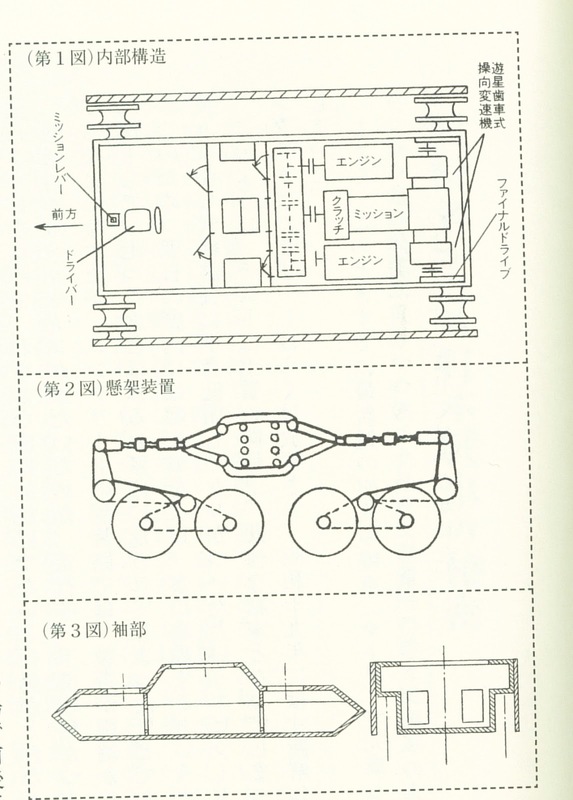 So in late 1939 IJA high ranks decided to give the multiturret tank design a new chance. This time the re should be no limitations towards weight and size of the vehicle. It only should be able to move at infantry speed in manchurian terrain and it should withstand direct hits of soviet contemporary 122 mm artillery gunfire. Transport should be done disassembled. In early 1940 IJA 4t Technical Research Bureau and Mitsubishi were ordered to develop a prototype. Soon it became clear that at leats 150 mm of armour would be necessary, resulting in a weight of more than 120 t. Therefore the existing tank tecnologies could not be used as they only allow a maximum weight of up to 30 t. So much basic development work had to be done first. As the project was rated top secret most development and production work was done in small, separated and even soundproofed barracks at 4 th Technical Research Bureau in Tokyo using the designation "Mi-To" (for Mitsubshi -Tokyo) to cover it. Even the engineers in charge with the design were not convinced that it would work. The suspension consisted of eight pairs of 2-wheeled bogies, each bogie sprung by a massive vertical coil spring. The driving wheel was located at the rear. The armour was partly arranged slopedbut hte side armour was vertical. Basic armour strength was 75 mm on turrets, bow, rear and upper side armour, 35 mm on lower side armour and 50 mm on the roof to simplify handling. The final armour strength was archieved by bolting additional armour plates on near the frontline. The tank was separateds into three compartments by two bulkheads consisting of 20 mm armour plates with two doors each. There was the forward fighting compartment with the central drivers seat and the ammunition racks for the 47 mm turrets, the main fighting compartment below the central turret and the engine compartment in the rear half of the vehicle. The engines were placed side by side with a small maintenance corridor between them. The rear turret was placed above the gearbox making it a quite loud place. Development was done in March 1941 and prototype production started on 14.04.1941. It was planned to build a less armoured test vehicle within 3 months. Many non-secret parts were delivered by private companies. The rest was built at the barracks. But after just one month it became clear that the amount of raw materials provided by the army for the project would not be enough. Several rare metals were depleted and due to the war against China there was no chance to get further material soon. In addition there were problems with the cooling system. So the decision was made to postpone the production for 9 months until January 1942. The hull was finished on 08.02.1942 for first mobility tests. The turrets should be built by Mitsubishi until May 1942 but only the bow and rear turrets were finished until then. Due to the lack of steel the main turret could not be finished with the upper armour plate missing. Nevertheless the superstructure was built and the smaller turrets implemented. With a basic armour strength of 75 mm and 35 mm turret roofs the total weight was already 96 t. The necessary remaining raw materials were not available before 1943 and it was impossible to continue without them. So the development was again postponed. Only mobility and basic handling tests were done with more or less success. Until summer 1943 the final tests of the prototypewere done and the project officially demonstarted to IJA High Command. At this time the vehicle received the official short designation "O-I" (O = short for superheavy, I = first design). The tank impressed the spectators and therefore an immediate start of field trials was ordered. These should be done at Sagami Army Arsenal. So the prototype was disassembled within one night and the parts were sent to the arsenal during several nights by truck. On 01.08.1943 assembly was finished and tests started the same day. The vehicle had no problems with hard and semi-hard terrain but after driving on muddy terrain it sank in up to the coil springs, damaging the suspension. It was recovered and several tests were finished on concrete. The damage to the suspension had to be repaired as it inflicted damage to the concrete. So further tests had to be postponed. So the tank was disassembled from 03. to 08.08.1943 and sent back to 4 th Technical Research Bureau. The further fate is unknown but the project wasn´t continued. It´s possible that it was shipped to Manchuria for further trials but there is no evidence of this. 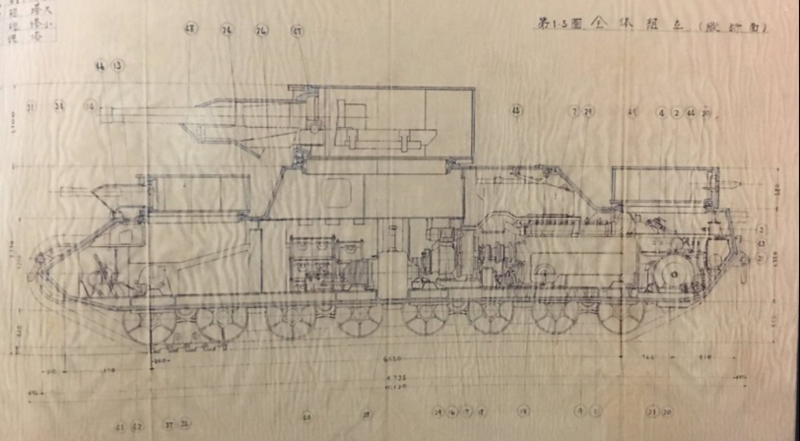 Soviet sources mention a motorised wooden mock-up found in Manchuria. Even if the tank would have reached operational status there are several questions regarding a use. Main problem was the raw material situation making it almost impossible to produce such massive constructions. In addition vehicles like these were prime (and easy) artillery and aircraft targets making a successfull use very unlikely. And the contemporary development of AT-weapons did not stop making even 150 mm of armour not unpenetrable in 1944. Another (the last?) example of a crawling, monstrous, multi-turreted "breakthrough tank" concept that had emerged in the interwar period. Very interesting information - I was not myself aware of this. While the (typical) dogged persistence of the Japanese military in developing this project is, in a sense, admirable, it seems to me that the repeated delays relating to the novel aspects of the proposed vehicle, as well as shortages of such basic materials as steel, might have sent a message to the developers earlier that this was too much of a burden on the system to bring the project to completion in reasonable time. In any event, the fate of the few other "breakthrough tanks" that made it to the battlefield invites its own conclusions. Thanks for posting. Best regards, JR. The OI exp is a beast in WoT's, I stopped playing over a year ago pretty much, went back on for a few games but always bottom tier - last few games were in my Tilly against tier 6 - I could not pen the OI anywhere even using prem rounds. Gave it up again especially with the new physics rubbish. Playing AW mostly PvE for fun now.